A Species Of One ? How many members of your species remain in existence today? If you said over 6 billion, you'd be wrong -- at least if the human species were held to the same standard as other creatures by the federal government. Oh, you'd be correct factually, of course. There are over 6 billion members of the species homo sapiens in the world. This taxonomical definition of "species" is not, however, what federal law means when it refers to a "species." "The term 'species' includes any subspecies of fish or wildlife or plants, and any distinct population segment of any species of vertebrate fish or wildlife which interbreeds when mature." The phrase "distinct population segment" is deliberately vague political mushspeak, designed to create an almost infinite number of new "species." This definition can be applied to any group of animals or plants that distinguishes itself from a larger group by any physical characteristic. The difference could be in the length of a creature's arms or legs, the shape of its nose or ears, the color of its skin, fur or plumage, or any other genetically determined trait that is humanly observable. Next time you're in a park that is frequented by flocks of pigeons, see how many potential new species you can find, and you'll understand how broadly and subjectively the Endangered Species Act could be, and often is, interpreted. Imagine if our government looked the same way at people. The human race would be not one species, but tens of thousands, if not more. For starters, every different ethnicity would be a species of its own. A new species would be designated for every color of eyes, hair and skin, as well as ethnically determined shapes of eyes, noses and mouths. These "species" would be broken down even further, among those subgroups within each group that have free or attached earlobes, bare or hairy legs, narrow shoulders, webbed toes, you name it. The number of human species would then be multiplied exponentially by all the various combinations of these traits. In the United States, where groups of people from every part of the world have emigrated and intermarried, the number of such combinations is practically infinite. But that's not all. Geographic location can come into play when determining a "distinct population segment" as well. 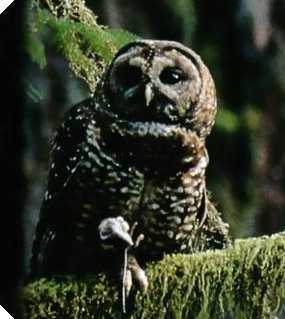 For example, the Northern spotted owl, so beloved by the environmentalist Left that it became an informal mascot of the Democratic Party ten years ago, is actually, biologically, of the same species as the California and Mexican spotted owls. Yet for years, it was listed as a separate and endangered species under the ESA. If people were perceived in the same way, with the human race scattered all over the globe, many new species of man would be created for every state or province in every nation in the world. The North Dakota red-haired white person would be a different species from the Minnesota red-haired white person, and so on. There are so many traits that separate each person from so many others, that if it weren't for the ESA's requirement that members of a species must be able to interbreed, one might argue that every one of us an entire species of his own. Of course, the ESA's definition of "species" is not applied to people, nor is it intended to be. The reason for this is that the redefining of the word "species" was done for the purpose of prefacing it with the word "endangered." Since environmentalists and animal rights activists consider humanity to be a competing interest, applying the ESA's protections to people would be counterproductive. It is the endangerment of a species that lends it a special priority. That's why people aren't allowed to be "endangered." It would be difficult, even for an environmentalist bureaucrat, to justify driving people from their property (i.e., "habitat") for the sake of an endangered animal, if the people involved were classified as endangered also. Don't think people are capable of being endangered? Maybe you'll change your mind after reading the definition of "endangered species" from Sec. 3 of the ESA. "The term 'endangered species' means any species which is in danger of extinction throughout all or a significant portion of its range other than a species of the Class Insecta determined by the Secretary to constitute a pest whose protection under the provisions of this Act would present an overwhelming and overriding risk to man." In this definition, "significant portion" is the obligatory elastic phrase, whose meaning is to be determined subjectively, by somebody with an activist agenda. This way, a creature doesn't have to be in danger of extinction in order to qualify as "endangered"; its population only needs to be sparse in a certain area, which will almost inevitably be the case. It would be preposterous, for instance, to suggest that seagulls are anywhere close to dying out, but move far enough inland that they are seldom seen, and -- presto -- an endangered species has been discovered. If the same standard were applied to people, those living in sparsely populated areas like Alaska would be "endangered." The steelhead trout is not itself endangered; it can be found throughout Washington state, Oregon and California. Yet there are ten geographic designations where it is listed as either "endangered" or "threatened." Anyone who knows a trout from a triscuit would expect the steelhead to be more plentiful in Washington than in Southern California, but the protectors of nature treat this unequal distribution as some sort of cosmic disruption. This has nothing to do with protecting a species from extinction. Rather, it's a matter of the federal government treating America as its zoo, each geographic designation being an exhibit in which the desired number of the animal in question must be kept. While protecting a prized collection of fish in Washington's Chewuch River, the environmental bureaucracy contributed to the deaths of four firefighters in July's wildfires in the Okanogan National Forest. The Chewuch was considered a restricted water source, because it contained several endangered species of salmon. Because of this, the firefighters had to ask the U.S. Forest Service for permission to airlift water from the river to drop on the fire. The USFS district officials, who had the authority to approve the water drop, happened to all be in a meeting at the time. For some reason or other, they could not be contacted there. As a result, the USFS didn't give the dispatcher the okay to send out the helicopters until 2 PM. The fire crew had initially been told to expect them by 10 AM. In the meantime, four of the people who'd been fighting the blaze were encircled by it, and burned to death. There was more at work there than just a tragic set of circumstances. There was a process deliberately put into place that assigned a value to human beings that was offset to some degree by the value of the salmon. Anyone could see that a 30 mile-long fire was an immediate threat to people's lives. The removal of a few chopper-loads of water from the river just as obviously was not. Nobody with an appropriate respect for human life would have built in a life-threatening procedural delay, out of concern for the possible loss of some interesting fish. But then, disrespect for humanity is almost a prerequisite for becoming an environmentalist. In the zero-sum view of man's relation to nature, one of the chief culprits of the extinction and endangerment of other species is the supposed overpopulation of the human race. That's why environmentalist organizations and population control groups are so closely allied. In its "fact sheet" entitled "Population and the Environment," Zero Population Growth hysterically warns that, "As human population increases, the diversity and number of plants and animals decreases. We lose one or more entire species of animal or plant life every 20 minutes -- some 27,000 species a year. This is a rate and scale of extinction that has not occurred in 65 million years." ZPG's "facts" are obviously fabricated, because they claim to have documented things which are entirely unknowable. We can infer, though, that they are using a similarly creative definition of "species" to that which is written into the ESA. Earth Day founder Paul R. Ehrlich is the honorary president of ZPG, an organization he helped create. In 1968, he penned The Population Bomb, one of the founding texts of the modern environmentalist movement. Despite the fact that time has repeatedly refuted his apocalyptic predictions (for example, that the use of pesticides would drop Americans' life expectancy to 42 years by the year 1980), Ehrlich remains a revered intellectual figure among the academic Left. To this day, he maintains his assertion that the world is incapable of sustaining a population of more than 2 billion, although ZPG now shies away from placing an exact number on the Earth's "carrying capacity." If anyone ever suggested that there were 67 percent too many fish of a particular species in existence, that species would immediately be broken down into numerous smaller "species," based on trivial differences within it, so that each new species was deemed needy of protection. It's only the human species whose members are judged to be so worthless that 4 billion of them have got to go. Environmentalists offer little respect for distinct segments of the human population, to say nothing of the unique characteristics of each individual person. The Chewuch River incident happened because our environmentally concerned government placed a high value on creatures with distinct and rare characteristics. It could have saved a little concern for those firefighters before they were needlessly killed. After all, there are no other four people like them in the world.